Bentley enjoyed meeting new people at our Barkus & Meoux parade. breed. In Part 1, we learned some of the history of this lovable hound. In last week’s Part 2, I described the breed standards to help you know what to look for whenever you are choosing a puppy or an adult Basset. Today, we will delve into their personalities and temperament. 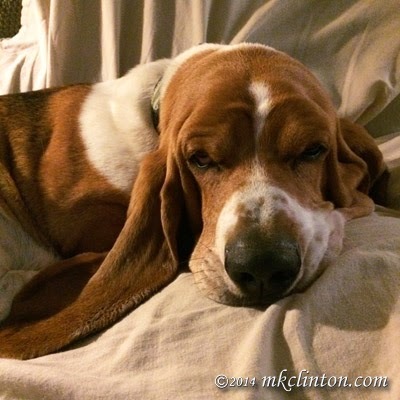 Basset Hounds are one of the most pleasant and good-natured of all breeds. This is a wonderful trait, because if you take them out among other people you will garner a lot of attention. Even at number 41 on the AKC registered breeds, it seems that few people have seen them in the fur. We were walking Bentley one day when a woman came out of her house to meet him. “I’ve never seen one in real life!” she exclaimed. The other common response is, “I used to have a Basset Hound. They are the best dogs!” Bentley loves meeting people and is certain that they want to meet him in return. Bassets are very sociable dogs and do not like being left alone for long periods. If you work outside the home, it is best to have another dog for their companionship or take them to doggy daycare. Bentley loves being with other dogs. Pierre is his best friend. Their droopy eyes, long ears, and abundant wrinkles can give the impression that they are sad. Nothing could be further from the truth. If you look past the head, you’ll notice their tails are cheerfully wagging. 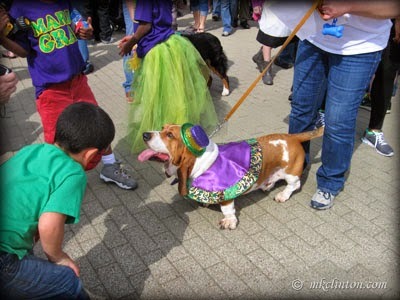 Although some Bassets are dignified, the majority of them are funny clowns. Being pack animals, they enjoy being around other dogs and their humans. Like most loving dogs, when you come home, whether you’ve been gone fifteen minutes or several hours, they are ecstatic to see you. As a short-legged dog, many people believe they are a small breed. An adult male Basset will weigh between 50 or 60 pounds. This does not seem to faze them, as they consider themselves the perfect lap dog. Bentley is very affectionate and loves to smother you with kisses. Speaking of smothering, he also enjoys laying his big head across our necks with little regard to whether we can continue breathing! My boy does enjoy his rest and relaxation. they do require moderate daily exercise, they are not known for their speed. You’ll find your walks interrupted by their desire to investigate any smell they encounter. Since they are bred to be hunters, they have a strong desire to follow a scent trail. You should always keep your Basset in a fenced area or on a leash. If they are allowed to run free and pick up an interesting scent, your recall will most likely be ignored. When used in hunting, they will follow a trail undeterred. Many hunters boast of their Hound Dog’s endurance in the field. However, Bassets enjoy their rest and relaxation. For this reason, they are prone to becoming overweight. It’s just as important to monitor their food intake, as it is to make sure they don’t become couch potatoes. When Bentley is in the mood, he will perform tricks. 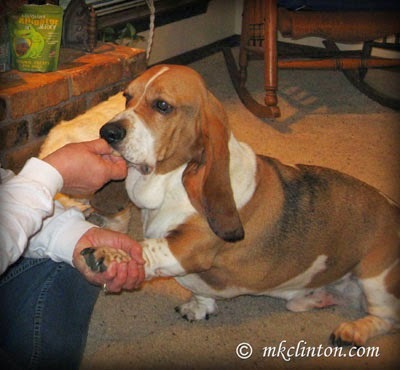 Training a Basset Hound takes time and patience. In Part 1 of this series, I mentioned that they could be stubborn and slow to obey. In their defense, they are simply thoughtful, deliberate free thinkers. Many puppies can be hard to housebreak. We were very fortunate that this was not the case with Bentley. To be successful in your training, it is important to remember that a Basset responds best to consistent training with praise and food rewards. Any harsh or punishment training will result in failure. They are very sensitive and their feelings are easily hurt. You should NEVER strike or yell at your dog. Such actions will cause them to shut down, pout, and lose their trust in you as the pack leader. If you use treats, love, and keep your lessons short, you will be successful in accomplishing your training goals. 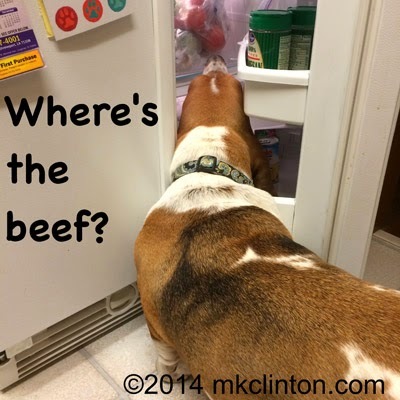 Food is great motivator for a Basset Hound! dog from becoming a nuisance barker. There isn’t a time limit on how long or loud they will bark. I personally love to hear Bentley bark, but I recognize that my neighbors don’t. They are famous for their mournful howling. We have tried to get Bentley to howl, but he doesn’t feel the need to sing the blues. To sum up the personality of a Basset Hound, they are lovable, funny, gentle, friendly, and devoted. To be fair, they can also be stubborn, make poor guard dogs, and are very vocal. As a Basset mom, I’m prejudice, but I think they are a fabulous breed and can’t imagine my life without one. I met my first bassets working as a vet tech and was just so surprised at how BIG they really are when you meet them in pawson! GBGV's love to hear ourselves howl too! We try to howl regularly both in the house and outside. You are such a handsome boy, Bentley! I just love their droopy ears. They are so sweet and adorable. 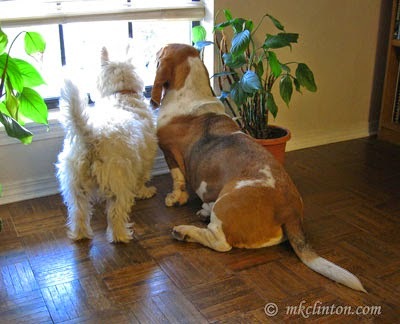 Whenever I see a Basset Hound I want to tell her a funny joke. Just looking at one always makes me smile. hahahaha @ the poodle and dog blog (above comment) Too funny! This has been a great series of Basset info!!! Loved this! Luckily, my Labs aren't howlers...glad Bentley refrains. Great piece on Bassets though - learned a lot. We know that if you lived by us that Bentley would be our best furiend! Luv bassets - dey are good pals. I've always been a big fan of Bassets! They are just so lovable and all the ones that I have met have HUGE personalities! Great post and pictures, thank you for sharing your knowledge. As for my Norman post, thank your husband I think that is so cool that he follows along with us. You guys rock! they are just wonderful! The owner of a toy store in my mom's town had a Basset Hound once. He was such a fabulous boy that my mom even forgot to pick a toy while playing with this dog... that's like magic.